“Concept car” is a tricky term. Technically, any vehicle that can’t be produced as shown fits this description. But while some designs are no more than a set of mirrors and wheels away from dealer showrooms, others haven’t a chance of seeing an assembly line. When Lexus debuted its LF-LC concept at the 2015 Tokyo motor show, everyone and their mother guessed it would undergo major surgery before hitting production — if Lexus would give the car the green light at all. But here we are, strapping into a very real, very street-legal Lexus two-door. It’s called the LC500, and it’s a spitting image of the LF-LC concept that dazzled the automotive community three years ago. Lexus offers two distinct versions of the LC: one with a naturally-aspirated V8 (our tester) and the other with a hybridized V6. Without any major visual differences, choosing between the two comes down to driving style. The V8 model is louder, lighter, and more powerful, but the hybrid offers 30 combined mpg and smoother power delivery. At a starting figure of $92,975 (including destination) for the 2018 Lexus LC500, there are a number of established rivals to consider. Buyers in search of a comfortable, potent 2+2 sports car will do well to shop the Mercedes-Benz SL450 ($89,195) and the Porsche 911 Carrera ($92,150). Though BMW has discontinued its 650i two-door coupe and convertible models, you can still find new examples on dealer lots. It’s time to see if Lexus’s halo starship can keep up with the German elites. The LC500 comes loaded with cutting-edge tech, but it flubs the execution in a couple of key ways. On board is a digital driver gauge with an integrated speedometer and tachometer, an available color head-up display, a 10.3-inch infotainment, an optional 13-speaker Mark Levinson sound system, dual USB ports, XM radio, and Bluetooth connectivity. When Lexus introduced its reconfigurable gauge on the LFA supercar in 2010, the automaker claimed a traditional tachometer needle couldn’t keep up with the fast-revving V10 engine. The LC500’s slower-revving V8 doesn’t have the same requirements but the moving display is still nifty. Less impressive is Lexus’ Enform infotainment system, which is operated via a smattering of physical controls and a touchpad. Response time isn’t as much an issue as the menu structure and lack of shortcuts to common features. Familiarity with Enform helps, but it never becomes intuitive or usable without focused attention. Apple CarPlay and Android Auto would certainly help make things easier, but neither system is offered in the LC. The LC500’s slower-revving V8 doesn’t have the same requirements, but its moving display is still nifty. There’s better news on the active safety front. Standard technologies include adaptive cruise control, automatic high beams, forward collision warning, automatic emergency braking, front and rear parking sensors, lane departure warning, lane-keeping assist, and a backup camera. For an additional $1,000, Lexus bundles blind spot monitoring, parking assist, and rear cross-traffic monitoring. In highway driving situations, adaptive cruise control follows the pace of traffic without abrupt braking and lane-keeping assist maintains a centered position within markings without ping-ponging the vehicle. In its standard configuration, the Lexus LC500 is a conventional approach to performance: a big V8 up front, rear-wheel drive, and an automatic transmission connecting the two. Lexus adds complexity with options like an adaptive ratio steering rack and rear-wheel steering, but our pared-down tester (equipped with only a limited-slip differential) is a purist’s pick for GT fun. Before naturally-aspirated powertrains yield to forced induction and e-assist technologies for good, let’s take a minute to appreciate the industry-wide roster of loud, proud motors on offer. There’s Dodge’s pick of Hemi V8s, Ford’s 5.2-liter flat-crank eight-cylinder, Audi/Lamborghini’s 5.2-liter V10, Porsche’s 4.0-liter flat-six, Ferrari’s twelve-cylinder duo, Lamborghini’s V12, and Lexus’ 5.0-liter V8. 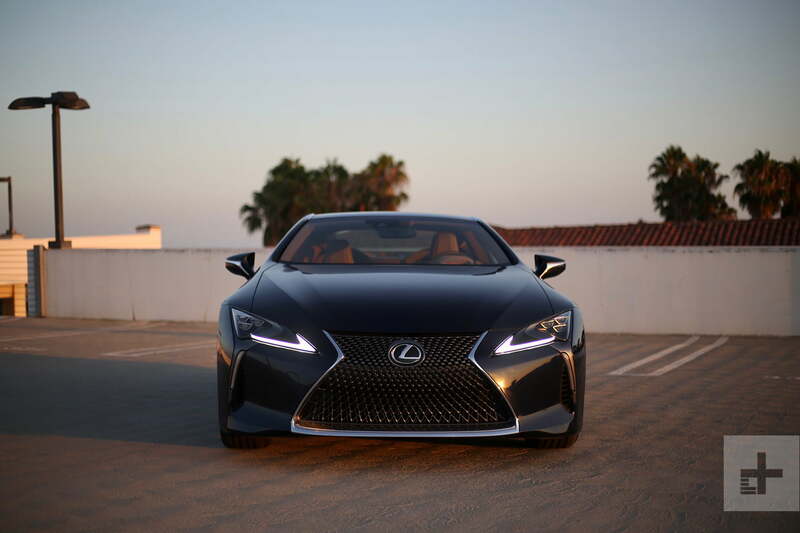 Found in the RC F and LC500, Lexus’ V8 is a smooth, soulful beast that appreciates a rigorous exercise regimen. Six drive modes and 10 speeds manage the LC500’s 471 horsepower and 398 pound-feet of torque, but a heavy right foot cuts through all that red tape at any moment. Nearly 4,400 pounds of mass tempers performance somewhat, but the LC500 still hustles to 60 mph in 4.5 seconds and tops out at 167 mph. Six-piston front and four-piston rear brakes work with Michelin Pilot Super Sport tires to keep the bodacious 2+2 in check. Under hard cornering, the LC500 tends to push its front end; only with stability and traction control switched off is it possible to bait the rear end out in a brief slide. A low center of gravity and adaptive dampers retrain body roll, though the LC’s substantial heft is never masked entirely. Lexus’ V8 is a smooth, soulful beast that loves a rigorous exercise regimen. Long, sweeping curves suit the LC500’s character well, but the car shines just as brightly when traversing great distances. Two 300-mile road trips proved the effectiveness of Lexus’ damper tuning and cabin insulation; rough roads and blustering winds do little to disturb passenger comfort. Our only quibble with the LC’s cruising behavior is during stop-and-go situations in comfort or eco mode. Under these conditions, the relaxed throttle pedal hates to be rushed, lurching the vehicle forward as the transmission jumps into gear. Though a large, 20-gallon fuel tank cuts down on fill-ups, an EPA-rated 19-combined mpg still necessitates a large fuel budget. The gap between a $100K and a $300K car may seem inconsequential to those of us who can’t imagine buying either, but in reality, these figures represent two different consumers with different expectations. For a $100K vehicle to draw the same attention and interest as a cars costing more than double is incredible. Even in a subtle color like our nightfall mica (dark blue) tester, the LC500 is dazzling. Futuristic styling, a powerful stance, and an elegant silhouette deliver as lasting an impact as the LFA of 2010. Lexus’ spindle grille is as controversial a design element as they come, and it simply overpowers any other aesthetic cues in some applications. 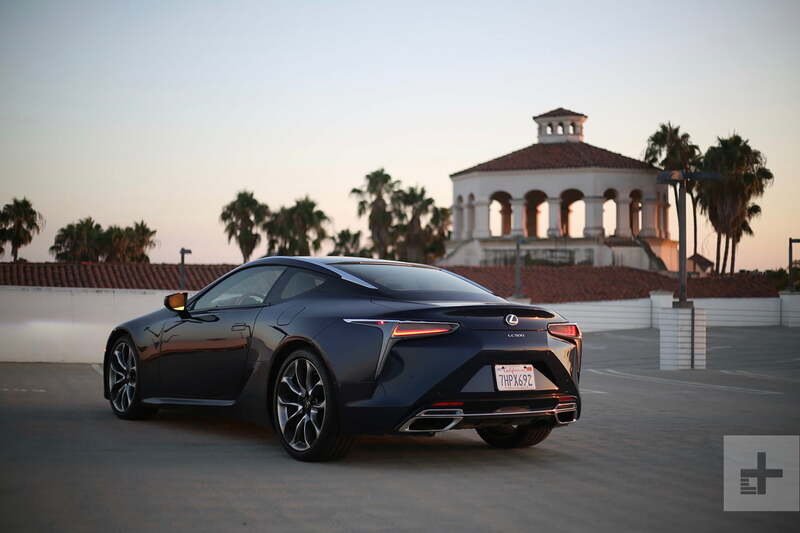 On the LC500, however, the hourglass shape suits the vehicle perfectly, accompanying bold elements like the optional 21-inch wheels, piercing LED daytime running lights, and notched C-pillar. Undermining the exterior wow-factor somewhat is an astonishing amount of brake dust. Regardless of driving behavior, Lexus’ chosen brake compound coats the LC’s flashy wheels in grimy residue after only a few miles of driving. In the grand scheme, it’s not a big issue, but owners might become annoyed with how often they need to visit the car wash or touch-up their rims. Futuristic styling, a powerful stance, and an elegant silhouette deliver a lasting impact. Like most 2+2 performance vehicles, the rear seats are best used for easy-access storage or to cart small children. The shallow trunk fits a pair of low-profile suitcases within its four cubic-foot compartment, but the rear seats do not fold to accommodate longer items. Lexus offers the same basic warranty as its key German rivals: four years or 50,000 miles of coverage. Also included are the first two scheduled services at 5,000 and 10,000 miles, respectively. Lexus is consistently ranked among the most reliable brands (not just among luxury automakers), with most or all of its nameplates topping the long-term dependability charts. Though the LC is a new model, it shouldn’t give owners any more headaches than any other Lexus-branded vehicle. Neither the NHTSA nor the IIHS has crash-tested the Lexus LC500, so no safety ratings are available. With the BMW 6 Series Coupe now out of production (and the 8 Series still a year away), the Lexus LC500 is uniquely positioned as a fixed roof, V8-powered GT car for under $100K. Unfortunately for Lexus, the LC’s price point steps on the toes of two indirect but fierce competitors: the Porsche 911 Carrera and Mercedes-Benz SL450 Roadster. Both of these vehicles fit the bill for a comfortable, dynamic daily driver, and both have the advantage of nameplate recognition. The LC500 looks spectacular regardless of spec, but given the opportunity to customize our own, here’s how we’d do it. Painted in smoky granite mica with rioja red leather interior, our ideal LC500 would include the safety-centered convenience package ($1,000), touring package ($1,900) with semi-aniline leather, Mark Levinson sound system, and Alcantara headliner, Torsen limited-slip differential ($390), 20-inch 10-spoke alloy wheels ($1,210), color head-up display ($900), and carpet trunk mat ($105). With the $1,025 destination fee, our configured LC500 would retail for $98,420. Every minute behind the wheel of the Lexus LC500 is a moment of celebrity. Dashing good looks, sublime road manners, and a sonorous V8 make for a grand tourer reminiscent of vaunted nameplates like Aston Martin’s DB11. At this price point, no other 2+2 offers the same theatre or stylistic daring style, which is enough for us to overlook its rougher edges.